It is a legitimate question to wonder why the levels of “no opinion” in the Castleton Poll’s presidential approval question is 9 percentage points higher than the figure found on the Gallup Poll. It would be wrong to assume that Vermonters are less decisive than Americans in general. Instead, it is more likely that the differences are a factor of different interviewing strategies—what are known as house effects. House effects refer to differences in measurement that occur from varying interviewing techniques. The Castleton Polling Institute readily accepts “don’t know” responses, especially in cases where it is likely that many members of the public will not have a fully-formed opinion. We accept the “don’t know” responses because we do not what to create opinion by having respondents give an answer that is either arbitrary or insincere. With the primaries—although still a long way off—preceding any general election, it is worth exploring how the various candidates and potential candidates are seen among those in their party. Phil Scott is seen favorably by Republican, Democrats, and Independents alike. He starts his campaign with a high level of name recognition, and net favorability ratings from Vermonters regardless of party. Among those who say that they follow news about Vermont politics either very closely or fairly closely, Scott’s favorable ratings (77 percent) outpace his unfavorable (10 percent) by a 67 percentage point margin. Additionally, 33 percent of those who follow news either very closely or fairly closely see Scott in “very favorable” terms. Looking at Figure 1, it is important to note the relatively small sample sizes for some of the candidates. The question of favorability was only asked of those who have heard of the candidate, and the data in Figure 1 is based solely on those who identify as Republican or lean Republican. Scott Milne, who was the 2014 Vermont Republican candidate for governor and who came within a couple percentage points of beating the incumbent Democrat, also enjoys a high level of favorability with Republicans in Vermont, with a net favorability score of 61 percent among those in his party. Also having make a bid for Governor in the past, Randy Brock enjoys relatively high name recognition—70 percent with Republicans and Republican leaners, and 60 percent overall. With unfavorable ratings only at 17 percent, his net favorables among Republicans is 41 percentage points. (Vermont Public Radio has recently reported that Milne and Randy Brock are considering a run for Lieutenant Governor in the open seat being vacated by Phil Scott). The sample size of Republicans weighing in on Heidi Scheuermann and Bruce Lisman are too small to give anything more than a passing glance. Lisman declared his candidacy while the poll was in the field. Prior to his declaring his candidacy, only 16 percent of respondents recognized the name, but after he declared, we saw the awareness go up to 26 percent, giving a 21 percent overall average. It is important to note that Scheuermann, a state representative from Stowe, has not indicated that she is running for the highest office in the state, but she was included in the poll because of her standing in the party and in the general public. Among Democrats and those who lean Democrat, the current Speaker of the State House, Shap Smith, has the highest level of favorable ratings, and when we subtract unfavorable ratings from his favorables, he has a net score of 57 percentage points. Smith also enjoys the highest level of name recognition, with 62 percent of Democrats having heard of him as well as 62 percent of the general population at large. Matt Dunne enjoys 59 percent name recognition among Democrats and 58 percent among the general public. If we separate those who identify themselves as true Democrats from those who lean toward the Democratic party, Dunne has a higher recognition among the former group (63 percent) than among the latter (57 percent). Dunne’s net favorability is 35 percentage points, but 40 percent of Democrats (and 42 percent overall) have not formed an opinion on Dunne either way, giving the campaign more empty canvas upon which to paint. Like Lisman, Vermont Secretary of Transportation Sue Minter declared her candidacy while the Castleton Poll was late in the field; there was not a lot of data collected after her announcement to pick up a change in name recognition. Overall, 41 percent of Democrats have heard of Sue Minter. Minter’s net favorability among Democrats and those who lean Democratic is 44 percentage points, with 48 percent of the Democrats who have heard of her saying that they haven’t formed any opinion yet. Even more so that Matt Dunne, Minter has a large segment of her party and the general public who are waiting to form a nascent opinion of her during the campaign. 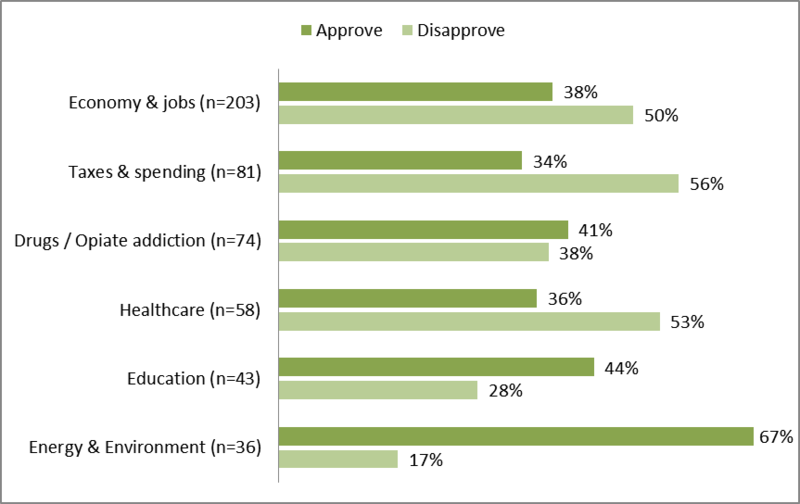 A plurality of Vermonters (40 percent) initially identify as Independent in response to the following question: “In politics today, do you consider yourself a Democrat, a Republican, an Independent, or something else?” Another 18 percent identify with a third party. About half of those who initially identify as an Independent or affiliated with a third party (51 percent) say that they lean more to the Democratic party, and another 25 percent say that they lean toward the Republican party, leaving only 20 percent of that group—12 percent of the total sample—as true Independents or third party. So with an overall sample size of 85 Vermonters and a Margin of Error of +/-10 percentage points, we will treat the views of Independents with a grain of salt, understanding that the results are only suggestive. The candidate with the highest level of favorability and the highest net favorability score among Independents is Phil Scott (75 and 73 percent, respectively), followed by Scott Milne with 59 percent of Independents expressing a favorable view and a 57 percent net favorability score. 58 percent of Independents who have heard of Minter and Scheuermann have not formed an opinion; among Independents, 54 percent who have heard of Lisman and 50 percent who have heard of Dunne have not formed an opinion. 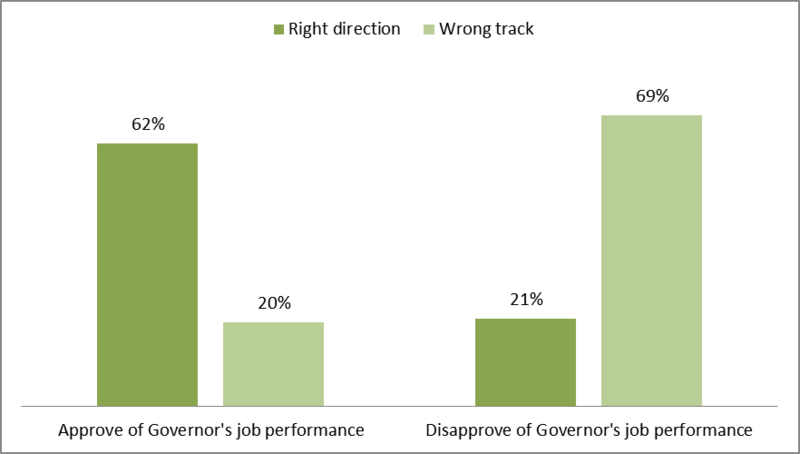 The campaign has not yet kicked into gear, and we should expect public views to change with the dynamics of the campaign, but this poll marks the starting point for the 2016 gubernatorial race. Methodology Details: for a PDF with methodology details click here. Castleton University students, staff, and faculty joined the Rutland community at the Paramount Theater to watch the CNN GOP Republican Presidential Primary debate as a community. Thanks goes to Steve Terry and Mike Smith (WCAX political commentators) for setting the stage and convening the gathering of Vermont citizens. Watching as a community, spending the evening with fellow voters who will have the ultimate say next November, was nothing short of exhilarating. Debates are public events and should be watched and discussed publicly. Here’s my personal take on the debate and the candidates’ performances. Senator Rand Paul sounded more interventionist than his competitors early in the debate as he discussed Middle Eastern policy, particularly the Iran deal, but before the end of the night, he reasserted his isolationist tendencies. Paul also withstood early insults from Donald Trump—that relationship is not friendly—for being so low in the polls that he did not belong at the grown-ups table. Paul also really went after Saudi Arabia. New Jersey Governor Chris Cristie tried to brand himself as the “true outsider” for being a Republican leader of a Democratic-leaning state. Cristie was the only candidate who focused on wealth inequality and opportunity differences, taking a page out of the Bernie Sanders stump speech. Former Governor Mike Huckabee tried to remind Republican voters of his Christian values by highlighting social issues, particularly focusing on Planned Parenthood and abortion. Huckabee’s appeal to the Christian right was loud and clear, if not a bit desperate. The only candidate to assert that cooperation and working across the aisle is a virtue rather than a vice was Governor John Kasich. Kasich took the position of moderate, spending a good amount of time reminding voters of his economic policies and accomplishments, which included leaving federal government having worked with the Clinton administration (whom he did not credit by name) to create a budget surplus. Senator Ted Cruz seems to be angling to attract Trump supporters and sought to sully the names of both Bush presidencies by criticizing their Supreme Court choices—specifically the appointment of David Souter by George H. W. Bush and of Chief Justice John Roberts by Georgia W. Bush. He also took the opportunity to remind voters of this unflinching support of Second Amendment rights. Ben Carson, one of the three major candidate to never hold elective office before seeking the highest office in the land, continued his streak of speaking softly and withholding criticism of his opponents—even going so far as to allow Trump to continue connecting vaccines with autism. I don’t think Carson hurt himself in the CNN debate, but he also had no break-out moment. Senator Marco Rubio seemed to have a good night; he sounded confident and well-informed throughout the long debate, especially when talking about foreign policy. He also stood with Jeb Bush in defense of speaking Spanish. Carly Fiorina spoke loudly and often while wielding a huge stick; she came of as the most hawkish in foreign policy, recommending a major (and costly) reinvigoration of the navy. According to 538.com, Fiorina interrupted others more than any other debater. This was clearly a break-out night for Fiorina, but it is yet to be determined if she will continue her rise through the polls or if she over-reached last night, appearing too aggressive. Speaking of aggressive, Donald Trump rarely disappoints. At times, it appeared that the debate organizers had set up a cage match where all were to gang up on Trump, and the Donald reveled in his top-status position. That’s all I am going to say about the candidate leading the polls at this time. Perhaps the candidate with the most to lose in the CNN debate was Jeb Bush. I think Bush did well, using the silly question about Secret Service code names to get a laugh and try to knock down Trump’s painted image of Bush as sluggish, low energy. Bush sounded like his moderate, establishment self for most of the night, holding his own in the one-on-one exchanges. The “Where’s Waldo” award goes to Governor Scott Walker, who seemed to leave the stage at periods in the debate, perhaps to get a bite to eat, to tour the Reagan library, or to find a union to bust … who knows? Walker failed to assert himself, looking less like a front-runner and more like an also-ran. He took some heat from Trump about the Wisconsin economy, and during that exchange he was probably most happy to finally have the camera on him and his Nixonish bead of sweat on his upper lip. That’s my take on the CNN debate. The winner will be determined by the polling coming out this week, but I think the loser was CNN, particularly Jake Tapper, who in my estimation did an abysmal job moderating the debate; it was a job unbecoming a journalist and served neither the GOP, the candidates, nor the voters particularly well. On the other hand, Project 240 served the Rutland community well by presenting a public space for this most public event.